The ultimate lunch or dinner gift for two. 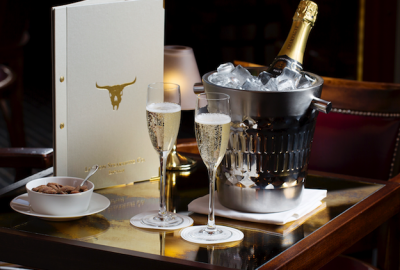 Enjoy a glass of Champagne each, followed by a three course meal from a luxury set menu, with your choice of a bottle of wine from our wine list up to £50 in value. A voucher number and a printable gift voucher will be emailed to you, valid for one year, which is redeemed when you book. You can redeem the voucher 24hrs after purchase.